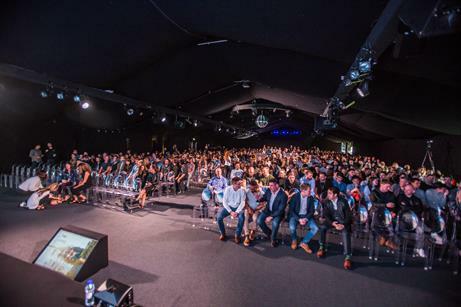 The Hut Group held its corporate conference followed by an evening party for 1,000 delegates on 14 June, organised by Make Events. As the company had grown significantly within the last 12 months, it had run out of venues in their local area that would house its full company event. With only a couple of months to plan, Make Events was asked to create a space for 1,000 delegates for a business update conference. With a very tight two-hour turnaround after the conference, the same space needed to be able to hold an evening party. As there were no suitable events spaces in the local area, a large 40m x 25m marquee was constructed. The marquee was erected on the grounds of the Hale Country Club, which is a private members club, so Make Events had to be very mindful that the facilities were open to members during this time and all setup and deliveries had to be managed around this. As the audience entered the marquee, a black box with pumping music and lighting with rows of a 1,000 acrylic ghost chairs provided a modern look and feel. A large LED backdrop was installed for the conference content, creating the perfect setting for the MD's presentation. This was then later used for themed content for the evening event. The evening design was 'neon noir' – a theme that would appeal to a mostly millennial audience and create a grown-up nightclub experience. To enable the conference to be turned into a party in a two-hour period, all the furniture and stage set had to be considered. This challenge was met by stripping back the marquee after the conference and resetting it with bespoke furniture including neon webbed alcove frames for seating areas; a branded circular stage and DJ booth in the middle of the dance-floor; neon and white leather furniture and full lighting, sound and vision production. Music was really important to the client to set the tone for the evening. An all-female live DJ and band with percussion, vocal, violinist and sax was hired to generate the upbeat Ibiza-style soundtrack. To support the music, roaming entertainment acts that could bring the glamour and neon noir theme to life ensured that there was a constant stream of entertainment throughout the night to wow guests. My Protein is one of the brands The Hut Group own – with this a constant flow of pan-Asian inspired canapés was served. A selection of healthy cocktails for the more health-conscious staff and bespoke drinks that complemented the food were also offered. "It has been an absolute pleasure working with Make Events. The team are so patient, creative, passionate and go above and beyond to deliver fabulous occasions, thank you so much," commented Clare Rajanah, personal assistant to CEO & CFO at The Hut Group.